Linear flowers (ones that create long lines and often define the length and height of your final centerpiece) are long stemmed with blooms coming out from the sides of a central stem. These include common flowers such as snapdragons, liatris, larkspur, delphinium and gladiolus. 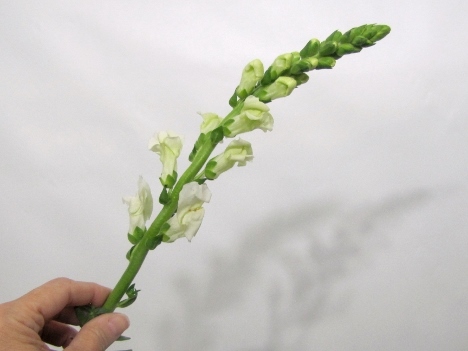 For this tutorial, I'm using white snapdragons, but you can substitute any flower you choose. 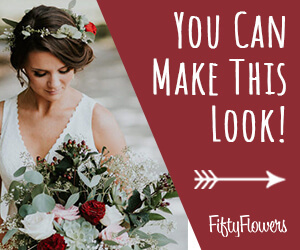 Keep in mind that design principals are the same, but that you can substitute different colors and/or flowers for a totally different look. 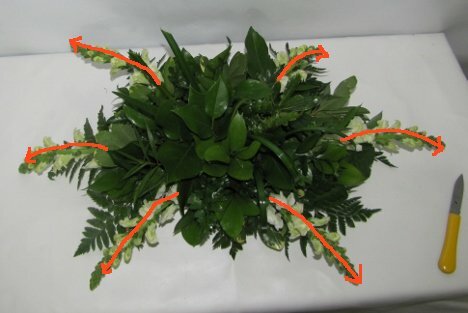 I've already demonstrated the steps needed for greening in a traditional "long and low" centerpiece. Need a longer or bigger arrangement? 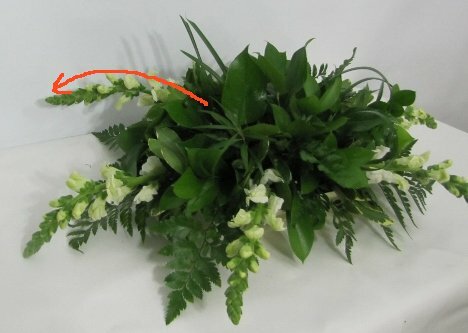 Simply make the stems longer (both the flower and greenery). If the piece is to be really large (as in a bridal table arrangement on the edge of the table) simply use a larger piece of foam as in an Oasis Jumbo Cage. 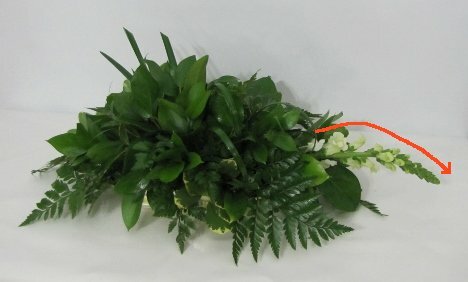 Longer linear greens such as myrtle, ﻿ Italian ruscus﻿ and sword fern have longer stems and can be used to create longer greenery lines. Insert them into the ends of the arrangement, mixed in with the other greens. 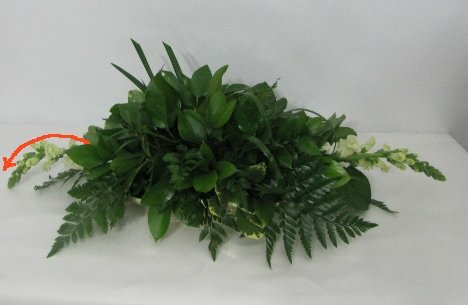 I'm now going to frame up my table arrangement using snapdragons. 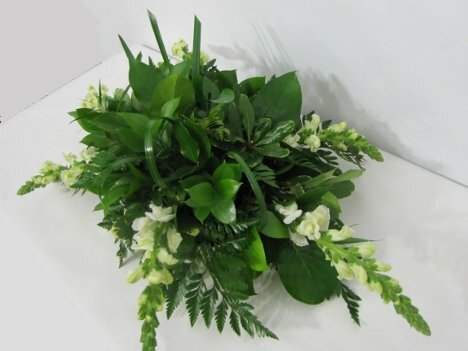 These are usually the longest flowers in the design and will define the final width and length of the arrangement. Always use the natural curve any flower to the best advantage. 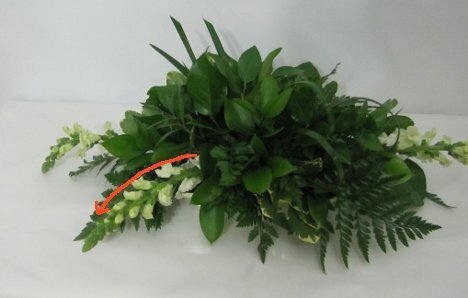 In this case, the snapdragon curves naturally, so I insert it in the end of the arrangement so that it follows the curve of the greenery down. I place a matching linear flower at the other end of the arrangement. Cutting the stem slightly short (because it's inserted on the side), I place another snapdragon. Place the fourth snapdragon on the opposite side. 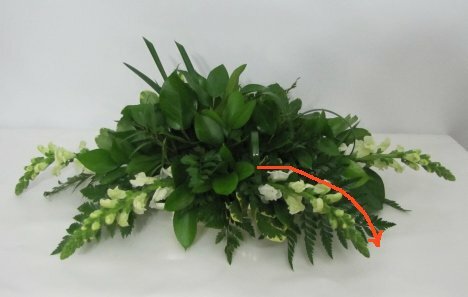 Keep balance in your arrangement by inserting the fifth linear flower on the opposite side. You can rotate the arrangement around the face you if that makes it easier. Keep in mind the width of the flowers versus the width of the table it is to be placed on. Rectangle dining tables at wedding receptions are usually a standard 6 foot or 8 foot and are usually 30" - 40" wide. You have to plan your centerpieces so they don't intrude on the space needed on each side for your place settings (including the water goblets.) 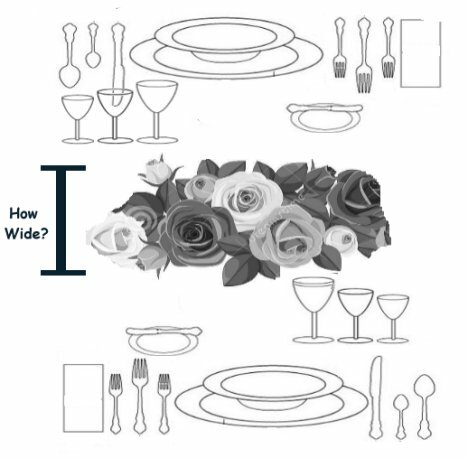 A typical place setting is usually 15 to 18 inches, leaving you only about 12 inches for a centerpiece width. Always check with your caterer or rental hall to find out the width and depth of your tables so you can plan ahead for the dimensions of your arrangements. The final width and length now defined, you will now cut snapdragons into shorter lengths to fill in around the rest of the arrangement.